Nancy J. Thomas is currently the creative director for Coats & Clark Yarns and a trip leader for Behind the Scenes Adventures. Her almost lifelong interest in needle arts is evident in her endeavor to promote crafts. To stay in touch with the end consumer, Nancy attends seminars, workshops and conventions throughout the United States and Canada, as well as teaching needle crafts on many levels. Aware of the importance of visibility for needle crafts, she was the co-chairperson for New York City’s Knit Out & Crochet Too events sponsored by The Craft Yarn Council of America for over 5 years. Nancy also has moderated numerous panel discussions and fashion shows and hosted events of Knitter’s Magazine’s "Stitches" conventions held in various venues around the United States. Nancy J. Thomas started her career with a degree in accounting before she got on the knitting career path. Her job as Financial Assistant for Vogue Patterns at the Butterick Company led her to Vogue Knitting in a round about way. Nancy created a job she loved. In 1981 Nancy was responsible for helping bring back VK which had stopped publishing in 1969. In 1982, she helped published the first issue of VK and as they say, the rest is history. For more than twenty-five years, Nancy J. Thomas has been the editorial voice of the most widely circulated knitting magazines in the country. In addition to being instrumental in the launch of Vogue Knitting Magazine in 1982, Nancy served as the publication’s editor in chief. 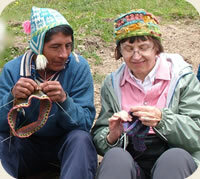 She was the founding editor of Family Circle Knitting and editor in chief of Knitter’s Magazine. Nancy is the coauthor of Vogue Knitting: The Ultimate Knitting Book, regarded as the most important knitting reference in print, and A Passion for Knitting. From 2000 to 2005, Nancy served as the editorial director of Lion Brand Yarn Company, where her expertise brought added value to consumers of this highly respected brand.